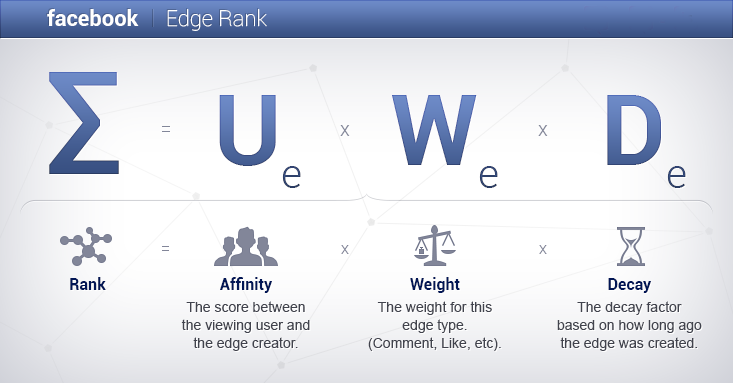 →What is Facebook EdgeRank and Why it is Important? What is Facebook EdgeRank and Why it is Important? We have already discussed a lot about the Algorithms used by Google for showing relevant results in its SERPs(Search Engine Result Pages). Now, it’s the time to discuss about Facebook which is undoubtedly, the best social networking website in this world. You can’t show dynamic contents to users without following some algorithms. As far as the interest of users are concerned, they always want to see top quality contents. In so many cases, people create their Brand Pages on Facebook and intially get lots of like as well. However, very few of their fan return to their pages which is quite unfortunate. For such users, the best place on facebook to reach the consumers is “News Feed“. Facebook follows an algorithm which works for showing best possible contents. According to Facebook, any kind of activity or task performed by you on Facebook is termed as “Edge“. For example- a status update, comment, Like, Video sharing, Picture sharing etc. As i mentioned earlier, Facebook EdgeRank is just an algorithm which works for showing best posts in Facebook Newsfeed. The EdgeRank is calculated on the basis of different factors which will be explained later in this article. Facebook Edgerank is the Algorithm used by Facebook to determine where and what posts appear on each individual user’s Newsfeed. How Facebook EdgeRank is Calculated? Affinity is the measurement of relationship between the creator of story and the viewing user. Closer the relationship, higher will be the Affinity Score. It means, more you “like” or “comment” on the story or other contents of any user, more will be chances of their appearance on your Newsfeed. Please Note that Affinity is one-way interaction. It means, if you will show more interaction with the stories posted by other user, that content will appear on your News Feed but your stories will not appear on theirs. Facebook gives more weight to Comments than Likes which is understandable as well. However, it doesn’t mean that simply sharing of Photos/Videos will improve your score. Engagement of other users also matters. For example- A plain text update having multiple Likes and Comments carry more weight than a Photo Post having no engagement at all. When Facebook release any new Features or Functionality, try to use it and share it with other as well because it gives more weight to them to increase their usage. As the name suggests, Time-Decay shows “How Old posts loses it Value or Decays”. Actually, it also depends upon the interaction of users. For example- if you are interested in any story which is 3 months old, it still has some chances to appear in your Facebook News Feed. It means, your content will maintain its freshness. Why does Facebook EdgeRank matters for You? More than 96% of the Fans never return to a Brand’s Facebook Page after the Initial Engagement. If you will work on improvement of your Facebook EdgeRank, your chances of reaching to your Fans will increase up t0 150 times. A survey shows that, about 27% of all time spent on Facebook is spent looking at the NewsFeed. It means, Facebook users spend more than 10.5 billion minutes total per day Looking at NewsFeed. Due to this reason, Improvement in Facebook EdgeRank will definitely help you. In United States, People spend more time on Facebook Newsfeed than six major news Sites. If you are an advertiser and looking to advertise your product on facebook, you can calculate your Facebook EdgeRank. If it is not good, try to improve it. It will help you to reach to more users. How to Improve your Facebook EdgeRank? Keep Your Posts Short :A survey shows that, Posts between 100 and 250 characters on Facebook gets more than 60% Likes, comments and shares. Longer posts are neglected by the users so keep it short and interesting. Be Visual : It is the human nature that people like visual contents. Sharing of Photo Albums, Photos and Videos gets 180%, 120% and 100% more engagement respectively. For this reason, try to post visual elements. You can also post a link as a photo with your Article’s Title and Url in caption. It will increase the reach. Ask Questions : I have personally experienced that people show more engagement in Questions like- Fill in the blanks or multiple choice questions. Just ask simple opinion-driven questions and get more than 90% engagment. Post on Daily Basis: 96% of your Facebook Fans never come back. To avoid this, try to post on daily basis. People always show more interest in latest topics. Be Relevant : Quality and Relevancy matters most for the users. If your want to advertise your brand, don’t post about it directly. Just write related topics otherwise users will lose interest. Be Timely: Before your start posting contents, set a time which suits you best. Once done, try to stick with it. For example- if you have decided to publish a post at 4 PM, do it on daily basis. Users will wait for your next post at 4PM. What About the Purchased Facebook Likes? Like Adsense Accounts, People also purchase Facebook Likes. I recommend you not to purchase Facebook Likes because it affects your site. It happens because, those fans never visit your blog or share, comment on your Facebook Post. It is another form of in-activity which is dangerous for Facebook EdgeRank. Always try to get the natural likes. How to Know my Facebook EdgeRank Score? Till now, Facebook hasn’t released any EdgeRank checker tool officially but so many un-official tools are already available on internet. You can also check your Facebook EdgeRank by clicking on below given button after signing into your Facebook account and selecting your Facebook Fan Page. After measuring your Facebook EdgeRank, the website will send its report to your Primary EMail account(One which is set by you in your Facebook Account). According to me, Facebook EdgeRank is helpful because it allows you to check your fan’s interaction in your contents. If it is not good, you can work on it for the improvement. Once improved, you will definitely get more visitors to your blog or website. More visitors alternatively means more revenue. What do you say? Let me know your views.